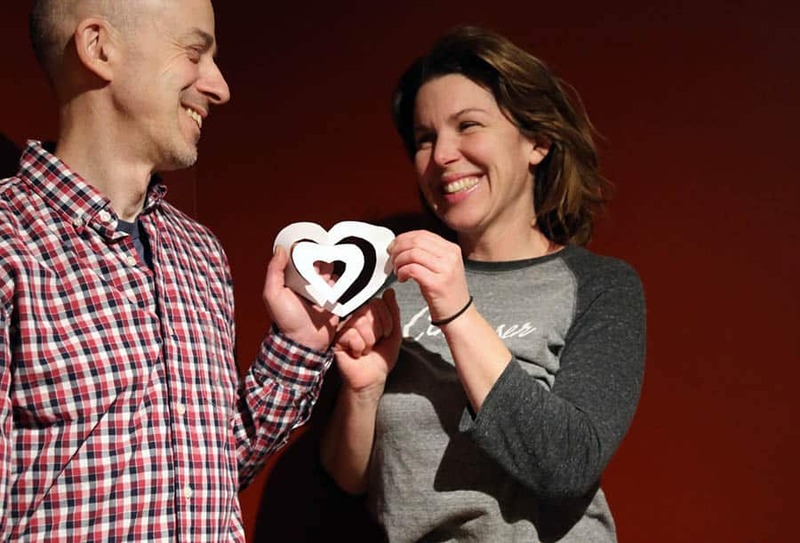 Decadent Chocolates, A Bottle of 5 Year Pommeau And An Impromptu Valentines Day Liaison. 2 Ingredients: chocolate and cream. That's it. Seriously. Or chocolate and almond butter. Or chocolate and coconut milk. Pair your home-made truffles with Eve's 5 Year Pommeau and woo your love (GET IT SHIPPED). The children are begging..."Mom, Mom we want to make Valentines Day presents!" Autumn sighs. 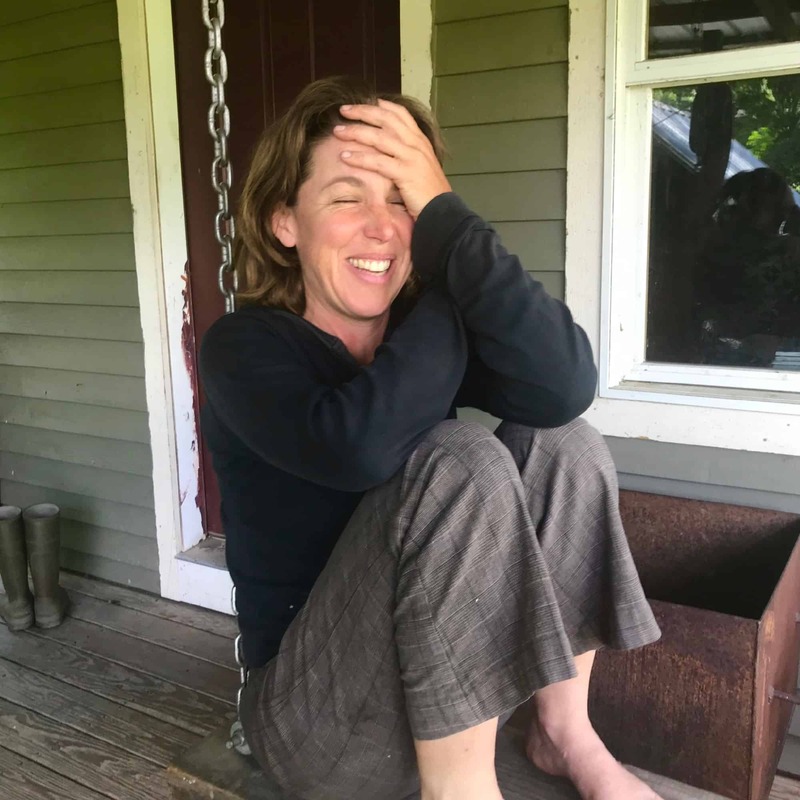 It's been along day, between trying to remember enough algebra to help Leila complete her work, participating in the weekly farm meeting and trying to get the Eve's Cidery newsletter written, her brain is feeling frazzled. Plus, they have to leave in an hour to go to circus class. "I'm not sure we have time to start a project now," she objects. But the children won't give up. "PLEEEEEASSSSSE" they whine. Autumn relents. She knows a recipe. It will take less than an hour. It requires simple ingredients, all on hand. It's sure to impress the recipient. And it's a good science lesson in the principle of emulsification. "OK, let's make chocolate truffles" She announces. "YEEEEAAAA" The children cry and jostle into the kitchen, donning their aprons, pulling out bowls and pots and climbing on the counters. 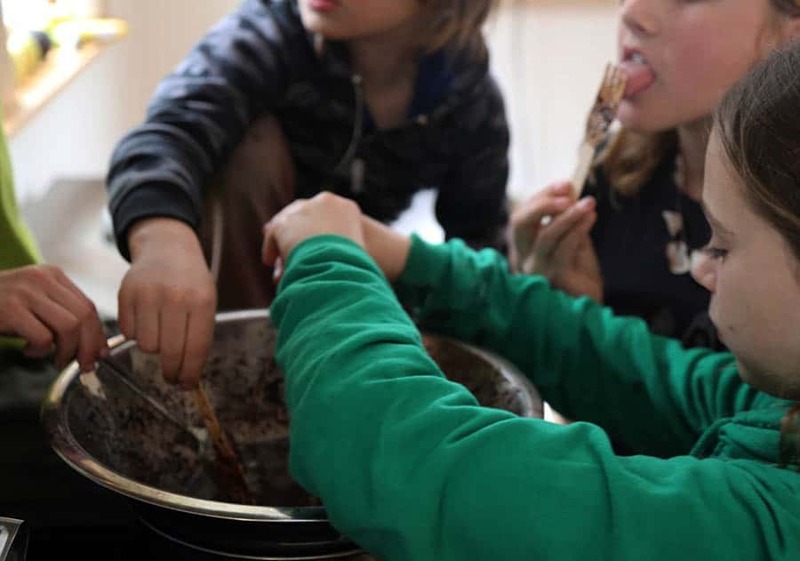 Different people get different batches: chocolate and cream for Celia, chocolate and coconut milk for Megan, and chocolate and almond butter for Ezra (follow links to recipes). 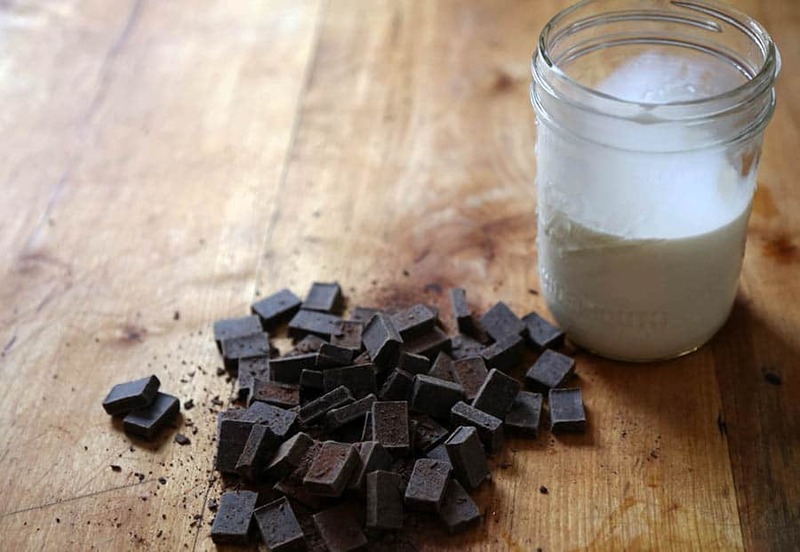 The recipe can be made with good quality baking chocolate and almost any liquid. 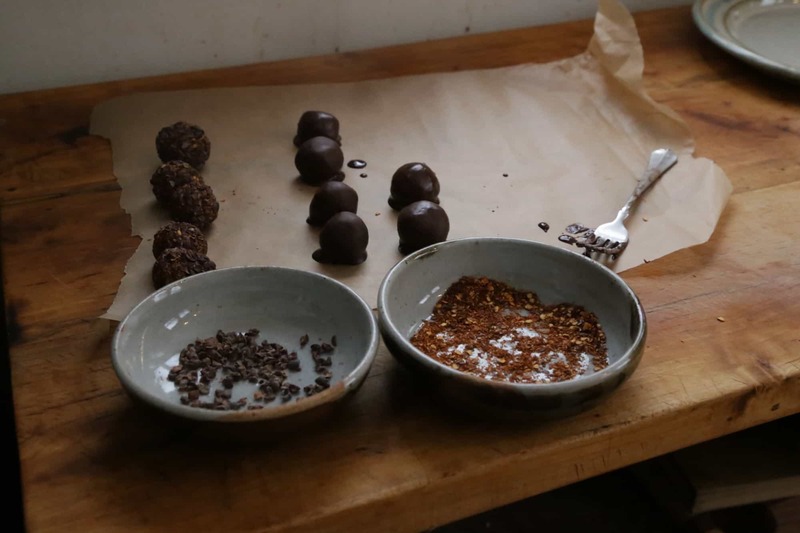 After gently melting the chocolate and liquid, and chilling the mixture until firm, the children roll the truffles into balls and roll the balls into various coatings: grated orange zest, cocoa powder, ground roasted almonds, melted chocolate, cocoa nibs and chili flakes. All the finger and spoon licking has really increased the energy level in the room, but luckily...it's time to go to circus. Whew! Autumn will clean up the mess in peace. It's Valentines day evening. The present was a success. The children are in bed. After washing the dishes, Autumn wanders into the living room. 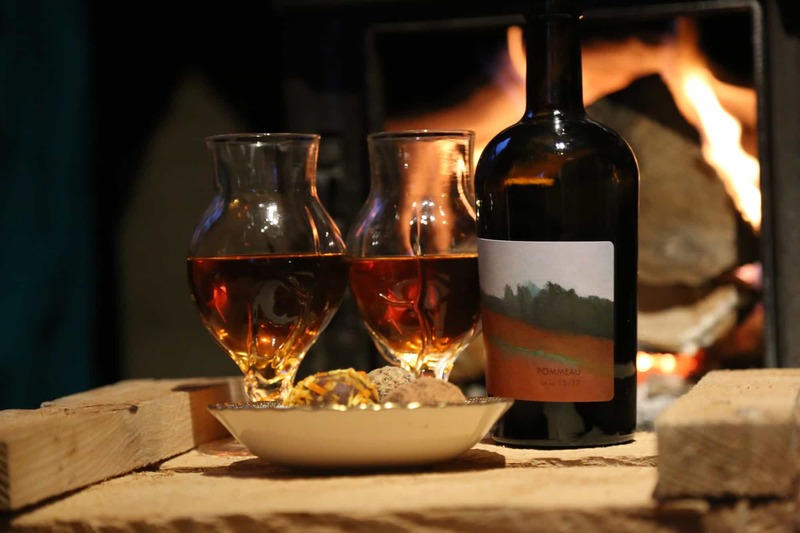 A glass of pommeau in front of the fire catches her eye. Actually, it's two glasses of pommeau and a bowl of elegant chocolate truffles! "Would you like to share?" her husband Ezra asks quietly from the shadows. "Oh yes!" Autumn says, batting her eye lashes. Eve's Cidery 5 Year Pommeau (ORDER ONLINE). As you may have guessed, this story is completely fictional. However, you never know what might happen if you find yourself by the fire with a box of chocolotes and a bottle of pommeau. Try it and see? The Pommeau ships within a couple days. Time to put cider on your table! If I popped into your house, would I find cider at your table? For a growing number of artisan beverage lovers, the answer is yes! But giving cider a seat at the table continues to keep me up at night. The Pairing Issue is a monthly "how-to" about bringing cider into your life through daily meals and simple friendly gatherings. Get cider delivered from our orchard to your doorstep. Simply choose your cider in our online store. We pack and ship every case ourselves.